A lot of people who own pets will let them sleep in bed with them as they can be comforting and during the winter nights they provide extra warmth. However while having your pet in bed with you might be nice is it healthy? Having your pet sleeping in bed with you is a great way to bond with it but there are a number of potential issues that could arise from this. The first major problem with letting your pet be in bed with you is hygiene. Most modern pets are fairly well groomed and when it comes to cats, in particular, they are often as clean if not cleaner than their owners yet even though your pet may be clean, that doesn’t make them hygienic. For one thing cats and dogs are prone to getting fleas and tics and while these do not thrive on humans they can cause difficulties and discomfort. However, the discomfort caused by fleas and tics may be the least of your worries. While it is reasonably uncommon, there is a chance that you could actually catch a more serious disease from the fleas and tics on your dog or cat while they are in bed with you. One disease that dogs can spread is called Chagas and though it is uncommon in Australia it could spread. Chagas disease is caused by a protozoan parasite that is passed by blood sucking insects. Another disease that comes from cats is called cat scratch disease and like Chagas it is passed on by the parasites that your cat may have on them. Admittedly these are relatively low risk, but any risk is too much if it can be avoided all together with ease. Catching disease is not the only problem with having your pets in bed. The other major issue is that having your cat or dog in bed may degrade the quality of your sleep. Cats and dogs naturally doze a lot of the time and do not generally sleep for sustained periods of time. We, on the other hand, need to get a good solid seven hours of sleep each and every night. As our sleep habits do not match up, having your pets in your bed with you is likely to affect your sleep so even though it is a nice way to bond with them. If you are unconvinced and still want to let your pet in bed with you then you should make sure that they are well groomed, flea and tic free and that you have exercised them during the day so that they are tired at night. Pets carry fleas and tics which can in turn cause you discomfort. The fleas and tics can carry a variety of diseases, though admittedly the chances of infection are low. They have different sleep cycles and may wake you up. If you are going to have them in bed make sure they are well groomed and tired. 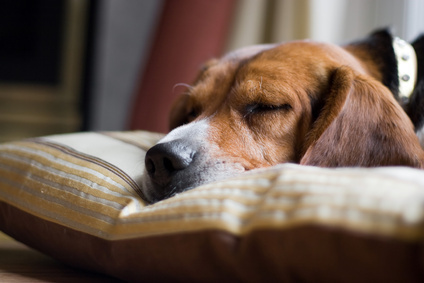 While having your pets in bed is a comforting you run the risk of affecting your sleep.